I was at the UK Faculty of Sport and Exercise Medicine’s Annual Meeting today, held at the wonderfully-titled ‘Worshipful Society of Apothecaries’ Hall in Blackfriars, London. 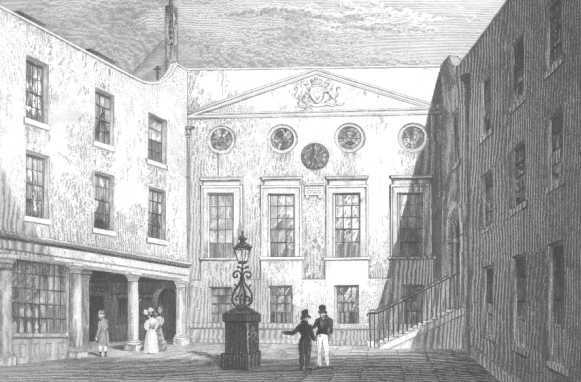 The Society and the Hall share a very interesting history, the Society itself being the largest of the Livery companies of the City of London with members originating from the Guild of Pepperers, and subsequently members of the Grocers’ company formed back in the Twelth Century. During their history, Society Members challenged the dominance of the Royal College of Physicians, and they can boast a number of previous Licentiates including Elizabeth Garrett Anderson who was the first woman to gain a medical qualification in the UK. It was in this unique setting that an interesting debate was held during the meeting concerning the question ‘Which is the best location for the medical and surgical care of the elite athlete – home, or away?‘ Should an athlete be sent abroad for treatment, for example, surgical intervention, or should they be kept at home for such treatment? The cases for and against ‘home’ treatment for athletes were put forward by two Internationally renowned Professors of Orthopaedic Surgery, both well known in the World of Sport Medicine. The arguments were related to issues of practice in the UK, considered to be the ‘home’ Country in this debate. Both arguments focussed on the perceived quality of care that could be provided in different Countries. The ‘home treatment’ case centred around a feeling that UK Orthopaedic surgeons are just as good if not better than their overseas colleagues, well-trained, and working within a strong clinical governance framework. The arguments for the ‘away’ case included the perception that a superior ‘whole package’ of care might be offered overseas, with better provision of rehabilitation. It was also put forward that some overseas surgeons might have a better reputation than their UK counterparts due to stronger marketing and self-promotion, and that perhaps UK surgeons reflect the generally reserved stereotype of the British people, thus making athletes more likely to seek treatment from overseas practitioners. What struck me during the debate and subsequent questioning was the focus on clinical competence and provision of rehabilitation, and the importance of the perception of the quality of these by clinicians and athletes who are their patients. Whilst these are no doubt very important points for consideration, there are other issues to consider in a decision for ‘home’ versus ‘away’ care. One such important issue that stands out for me is the provision of psychosocial support during a peri-operative or rehabilitation period. I have previously been involved in the care of several professional sports participants, living outside of their home Countries, who wished to return home for an operative procedure so that they could be near their families during at least the early part of their rehabilitation period. Whilst this may not seem important to some in the decision to provide the best quality of care, perhaps we are sometimes too hasty to forget the importance of such support for some athletes undergoing sometimes invasive and temporarily-debilitating procedures. It is perhaps not as easy to measure the value of immediate support from family and friends to athletes as it is to measure outcomes such as time to return to sport, but should that deter us from taking such support into account in making decisions for ‘home’ versus ‘away’ care? If we are to entertain the concept of patient choice and a bio-psycho-social model of practice as Sports Medicine Clinicians, then surely the ideal is to form a therapeutic alliance with our patients, making joint decisions about their care not only on the basis of the provision of the perceived best treatment available, but also on the basis of patients’ needs which are often complex in nature. It’s not all about what we might think is ‘best care’ – just ask your patient what else they think is important for them! CJSM would like to hear your views on the case for ‘home’ versus ‘away’ care, and your thoughts on shared decision making. I enjoyed the information shared, the discussion is a thought-provoking one. I suppose each athlete will have different feelings on this.